I’ve gotten together with the assistant pro at my club Byron Utley (right) to bring you some quick instruction and game improvement drills. We’d like to do one pro tip per week, but busy schedules may not allow that to happen. We’ll do them as often as we can. This week’s pro tip addresses swing path/plane in an effort to prevent “casting” and coming too far outside in on your swing. This tip will help prevent you from blocking, slicing or dead pulling. It will also help you hit a nice little draw. In this first picture (above) Byron has placed two clubs on the ground to show the proper swing path and target line. 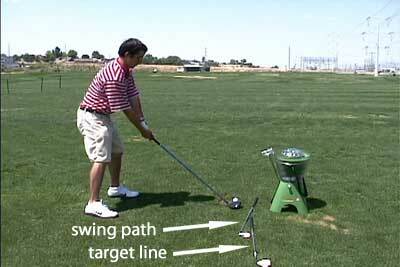 The club closest provides a visual of where your swing path should be. The rear club represents the actual target line. As you can see, the swing path should be from inside to outside. Coming from the inside makes it almost impossible to slice the ball. 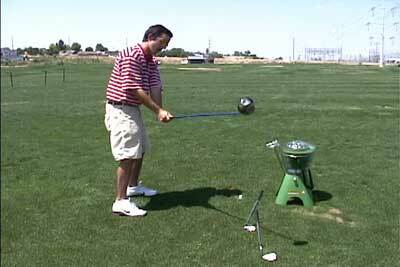 An inside out swing will also help you release your left side and generate more power. 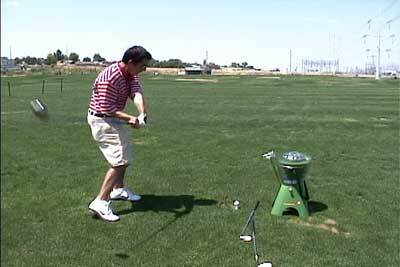 The 2nd picture (above) demonstrates in incorrect swing path. The club head is outside of the swing path club’s line. This club is being “casted” and will only result in slices or dead pulls. There will also be a loss in power resulting from the inability to utilize your entire body in the swing, and from cutting across the ball. The 3rd picture (above) shows Byron a split second before impact with the correct swing path. You can see that his club head is coming from the inside. It is similar to the baseball concept of aiming for center field and hitting into right field. By coming from the inside, Byron is loading great power in his right side of his body which will be released as he fires his left side to the target. The resulting shot was a long drive with a slight draw. We’ve encoded Byron’s Pro Tip into a video file that you can view in MPEG4 format. This is exactly what my instructor has been teaching me and I’ll be the first to admit, this really works. However, he has it set up a little differently for me. 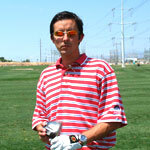 I place a tee two inches diagonally on the correct swing path and my job is to visualize the club going over both teeâ€™s. Obviously youâ€™ll want to release your hands before reaching the next tee, but by doing so will create the perfect draw. Iâ€™ve also learned to do a fade the same way, just reverse the line of the tees giving you an outside to inside swing path. For an effective fade, donâ€™t release the hands. Well skosiuk, you’ve just given away the secret of what Pro Tip #2 is!